Description: NJT 4109 arrives at Suffern Station with a train from Hoboken. Description: Awaiting its next assignment. Description: NJT 4109 was on the other end of this exursion with the Ex LIRR coaches on this end. Description: 12:53 pm westbound over Route 17 and into Rutherford. Description: NJT 4109 in push mode with a Hoboken bound train. Description: Two car eastbound train to Hoboken. Description: An eastbound New Jersey Transit train led by a former CNJ unit meets the NS H14. Description: NJ Transit SW1500 #502 towing NJ Transit GP40PH-2 #4109 through Secaucus NJ near the Transfer Station. This photo appears on Page 4 of the December 2007 issue of Railpace Newsmagazine. Description: NJ Transit GP40PH-2 #4109 waits for an assignment at Hoboken. Description: A closeup of 4109. Description: An ex-CNJ GP40PH-2 awaits the morning rush in Suffern Yard. Description: An ex-CNJ GP40PH-2 spending the night in Suffern Yard. Description: Difficult to catch, but NJT 4109 and company departs Secaucus Jct. for Hoboken. Description: NJ Transit GP40PH-2 locomotives #4109 and #4112 wait for assignments. Description: NJ Transit GP40PH-2 #4109 waits for an assignment at Hoboken on track 8. Description: A closeup of NJ Transit GP40PH-2 #4109. 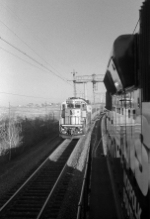 Description: An away photo of both locomotives.